This week the Redmen will take on the Gungahlin Eagles. The Vikings will look to build on a good performance against the whites last week which saw them put 59 points on the board. There are four changes to the 1st-grade side this week. 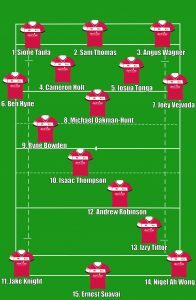 Sam Thomas makes in starting debut for the injured Michael Henry, Jake Knight comes back into the side after a week in 2nd grade and a 30-minute cameo in 1st grade which netted him 2 try’s, Nigel Ah Wong returns from a stint with the Brumbies and Ernest Suavai makes a comeback from injury. Look to see some familiar faces making an appearance off the bench late in the game with a number of players working their way back in from injury.